Nokia’ concept looks become reality! You may well ask, why is it that the beautifully crafted concept phones never develop into something you can buy? Well ask no more, Nokia has officially announced the details to the Nokia X7 and it has those futuristic looks that give it a uniqueness all of its own. The combination of stainless steel, glass and octagonal highlighted edges seem almost mesmerising so after a few minutes drooling we should probably take a look at what’s inside! Nokia has clearly made a point of taking this one down the entertainment path and the large 4″ gaming display springs to life when the pre-installed games, Galaxy on Fire HD & Asphalt 5 HD, are activated. The camera isn’t too shabby either with a high-end 8-megapixel resolution and HD-quality video. 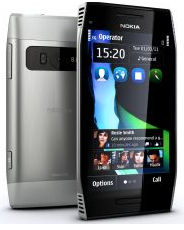 The Nokia X7 is also the first handset, along with the Nokia E6, that will feature the complete update of the Symbian software user experience. This includes fresh new icons, a faster Internet browser, improved text input and a refreshed Ovi Maps application. Nokia seems set to continue to build its market share and this new smartphone is certainly a step in the right direction.